Australia's Nick Kyrgios says he prepared for his Mexican Open final victory over world number three Alexander Zverev by going jet skiing. The 23-year-old beat Zverev 6-3 6-4 to win his fifth ATP Tour title. Kyrgios started the week 72nd in the world - his lowest ranking in five years, but is expected to return to the world's top 30 after this win. "I need to be way more disciplined, way better professionally and do the right things," he said. "I don't even have a coach, so maybe I start there." Kyrgios, who reached a career high ranking of 13 in 2016, added: "I went jet skiing at 5:30pm [before playing Zverev], so I don't think that's what a top 10 player would do." Zverev was the third top-10 player Kyrgios beat to reach the final, after victories over Rafael Nadal and John Isner and a win against three-time Grand Slam champion Stan Wawrinka. 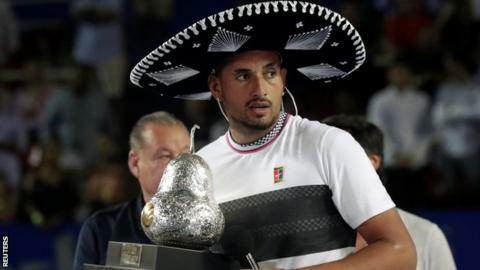 "I knew I was the underdog going in," said Kyrgios, who was handed a silver pear trophy and a black sombrero after his win. "I didn't expect much." He added: "It's an amazing feeling. He's an incredible player and doesn't have many weaknesses, so I knew I had to play my style of tennis. I'm really happy with the performance." During the week Kyrgios has battled hostile crowds, illness, injury, cramps and after beating Nadal, was criticised by the Spaniard for "lacking respect". "It's hopefully an example for people who are struggling and getting in some places you don't think you can get out of," said Kyrgios. "If I can do it, you can do it. "I was really down and out and didn't know what I was going to do, but you have a week like this and things can change." It was a straightforward victory for Kyrgios against German Zverev, after spending more than nine hours on court in his four previous matches. Zverev said: "If you beat four players like that in an [ATP] 500 tournament, you deserve to win it. He's the real champion of this week." The tour now moves to the United States for the first Masters 1,000 tournaments of the season, in Indian Wells and Miami.